Pharmaceutical/ Food Packaging and processing companies generally refer to the Online weigher inspection as a “policeman” on the packaging line. It is the weight control center on a production line, and protects against improper under or overweight packages ever reaching the customer. prepackaged goods defines the specific net contents laws on packages for processors, wholesalers, and retailers. In addition, the where, what, and how’s of testing and sampling procedures are dealt with in detail. It specifies the minimum number of packages to be inspected and defines lot sizes, as well as the number of packages to be opened to determine the tare weight value. It specifies the number of underweight packages allowed, as well as the weight of packages allowed to be underweight not exceeding the Maximum Allowable Variation (MAV). For prepackaged items commonly weighed by Online Weigher , the MAV varies according to package weight defines the MAV in weight gradations for prepackaged goods. State Weights and Measures offices regulate and enforce the net content laws defined. Official action resulting from package checking can take the form of oral recommendations, instructions, warnings, or legal action. An oral discussion between the inspector and the person in charge of the establishment may indicate general compliance with laws and regulations. The discussion may also point out inconsistencies in weighing patterns, precision, or variations worse than the inspector has encountered in other similar packages. • The machines employs PLC control combined with control screen, providing automatic detection for carton and box with insufficient bottle or weight and ejecting it automatically. 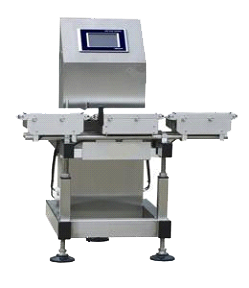 • Online check Weigher is Suitable for on line check weighing of Pouches, Bags, Cartons, Bottles etc. • DC 28V low voltage control power eliminates the danger of electric shock. • The control screen provides memory capability, allowing for memorizing the setting program of weight for saving weight change time. Online Weighing Machines offered comes with latest technology support and find application to control pack weight. We can propose these in different model choices as per the specific line condition and speed appropriateness. Our wide assortment of check weigher includes GSQC Check Weigher, GAC-7 Check Weigher and many more. These are designed and manufactured for meeting different industrial application requirements as they provide easy setting for various weights and products. These are checked at several parameters to ascertain their accuracy in measurement and durability. Further, these HACCP and GMP compatible models also come with support of validation functions so as to assure complete process reliability. Some of its features include high speed operations of handling up to 600 products per minute, capability to handle weights from 0.5g to 60 Kg, FDA 21 CFR part 11 compliant model, application suitability in areas like online check weighing of cartons, pouches, packet, bottles and others in food, pharma and other industry sectors. ONLINE WEIGHING MACHINE solutions offered find application in detecting weight of product as well as seeing if it matches with target weight with the auto-selecting device picking out unqualified products. These check weigher systems find suitability in areas including pharmaceutical industry for checking missing strips, tablets, leaflet’s, proper filling of injectable & vials and capsules. Other than this, it is also used in Food/Confectionary industry sector (for checking Concentrate, Cheese, Tea, Coffee, Bakery Products); Components manufacturing (for checking missing CD’s as well as Electronics Parts); in Cosmetics industry (for checking semi-filled/unfilled Talc Bottle, Tooth Paste in Tube) and others. The system’s superior frame structure allows maintaining accuracy with advanced digital signal processing providing for high speed and stable weighing operations. M/s Grups Automation, Exporter and Manufacturer of High Quality Vibro Shifter. We have successfully completed installations and can provide better after sales services in following countries / Cities.